very good, I am glad you got to the bottom of this. 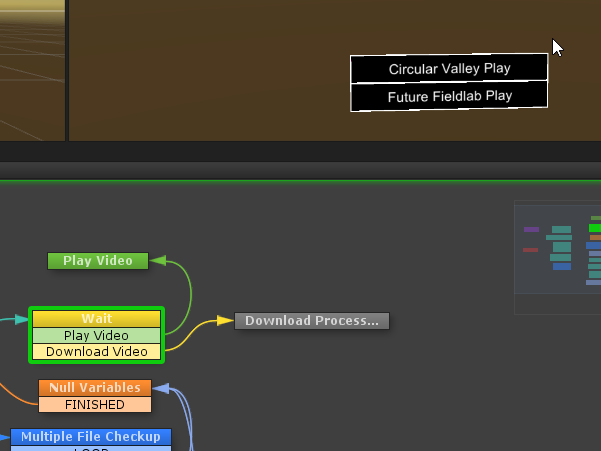 PlayMaker uGui is the proxy between Unity UI and PlayMaker, without it, you'll have to do write scripts to let PlayMaker know about anything UI, so it's mandatory if you don't know how to code, and actually, even if you know, I would still recommand to use it as it's a lot of work to provide such proxy, so you should capitalize on this and avoid waisting time and reinventing the wheel, IF this proxy is suitable for you of course If not, you are perfectly welcome to write your own. Basically I am able to check if a file exists, if not I can download it from my server using Easy Save (they have nice playmaker integration). then I can play the file... the file is an actual 360 video that get's downloaded & stored into the device. All Playmaker. This is only the Loading scene. crap... Let me know how it goes. I think we should then gather your findings into a dedicated scene we tag as oculus compatible, I am sure a lot of devs will appreciate this. I have no idea what's the problem yet... but until then I have another question. I'm trying to make my system less hardcoded. I have a system now that is Using Array Maker List, etc etc. Basically I'm able to check and activate the appropriate buttons for PLAY or DOWNLOAD. So if I look at a button that says Play, it will send an event for Play. My problem is that I need to know what Button send the Play event, as I will have multiple buttons that can have the Play state. As you can see here. Both buttons are in the "Play" mode, so both of them can send the Play Event.